Seamless, corrosion resistant exhaust duct, IPS sizes 2" through 24", for use in corrosive fume handling systems at temperatures up to 200°F. Duct exhibits excellent fire resistance and is classified for Surface Burning Characteristics. Offers exceptional physical properties, and is generally resistant to most: acids, bases, salts, aliphatic solutions, oxidants, and halogens. Chemical resistance data is available and should be referenced for proper material selection. Typical applications include: chemical processing, plating, water and wastewater treatment, laboratory, and other industrial and institutional applications involving corrosive fume collection, transfer, and reclamation. 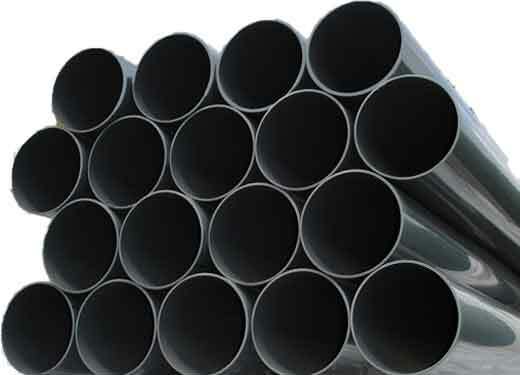 This specification outlines minimum manufacturing requirements for Chlorinated Polyvinyl Chloride (CPVC) iron pipe size (IPS) seamless, extruded round duct. This duct is intended for use in industrial fume handling systems where temperatures encountered do not exceed 200° F.
The material used in the manufacture of the duct shall be a virgin, rigid chlorinated polyvinyl chloride (CPVC) compound, with a Cell Classification of 23437 as defined in ASTM D1784. This compound shall be light gray in color. CPVC duct is extruded from Corzan® CPVC compounds. Fittings are fabricated from Corzan® CPVC duct and/or sheet stock material manufactured with Corzan® compounds. Izod Impact Strength notched @ 73°F D-256 2.6 ft.lb./in. As fittings described in our catalog are built to Harrison specifications, Harrison can also provide systems to SMACNA specifications upon request. The SMACNA manual (Thermoplastics Duct (CPVC) Construction Manual), is a good source of information for those involved in the specification and installation of CPVC duct systems. CPVC duct systems are easily assembled since they basically consist of fittings that are bell-end to receive plain-end duct, or in the case of plain-end fittings and pipe they are assembled using sleeve couplings. In the case of square and rectangular CPVC duct systems, these are always either welded together or connected by bolted flanges. Solvent cement is never used. Solvent cement welding is by far the most widely used process for joining CPVC pipe & duct. Properly assembled, it is certainly the easiest way to make quality sealed joints. 3. Using an applicator, approximately half the size of the duct diameter, apply PRIMER. The function of primer, in making quality joints, is to penetrate and soften the hard surfaces of CPVC duct. This must be done on BOTH surfaces to be joined. A simple rule of thumb, in checking the adequacy of surface priming, is the ability to scrape a few thousandths of the softened CPVC surface. 5. There are several sources of primer and CPVC solvent cement on the market. Before starting an installation, consult with your supplier of primer and solvent cement for advice on the best product to use for your application and work environment. Above 14" diameters, it is Harrison's experience that duct and fitting connections should be hot-air welded using CPVC welding rod and welding guns that are available from Harrison. Harrison usually welds each joint using three passes of 5/32" CPVC welding rod. Once the duct and belled-end fitting or coupling are securely seated, the fit should be secured by "tacking" the joint with a hot-air welding gun. The process of "tacking" creates a CPVC fusion between the two components, holding them in a position for the actual welding. Another benefit of "tacking" is that it seats the gap between the two components, so that during the actual hot-air welding, the CPVC welding rod and the two surfaces being joined are adequately heated to the point of a strong weld. If the joints were not first tacked then the hot air from the welding gun would pass through the gap resulting in the surfaces to be welded receiving heat inadequate for fusion with the welding rod. This would result in "cold joints" that are brittle and subject to failure under stress. In diameters thru 14", Harrison has found that CPVC duct piping systems can be readily joined via the solvent cement method. Beyond 14", the actual cementing and drying times become so protracted that sections of large duct cannot be maneuvered into position quickly enough to effect a good solvent fusion before the cement hardens and dries. It is our experience that with systems above 14", they should be joined via the hot-air welding method, using CPVC welding rod and welding guns available thru Harrison on either a rental or purchase basis. CPVC Corzan® pipe and fittings are not intended for underground use. CPVC shall carry a maximum operating temperature of 200°F and has the same self-extinguishing and low conductivity features as PVC. Corzan® CPVC material components used in the manufacture of duct pipe and the fabrication of fittings shall conform to Type IV, Grade 1 CPVC, Cell Class 23447, as described in ASTM D-1784. Fabricated (heat formed) duct diameters 22" and 26" thru 30" will have a 0.187" wall while 32", 34" and 36" & larger diameters will have a 0.250" wall. Fabricated duct shall consist of a singular buttwelded seam, thermally fused under computer controlled temperature and pressure, without the use of CPVC welding/filler rod. Reducer couplings having a size reduction greater than "two-step", shall be formed with cone-type body having and overall length generally calculated @ 4" per 1" size reduction, where space allows. One-step and two-step reducers will have a smooth-flow concentric design.